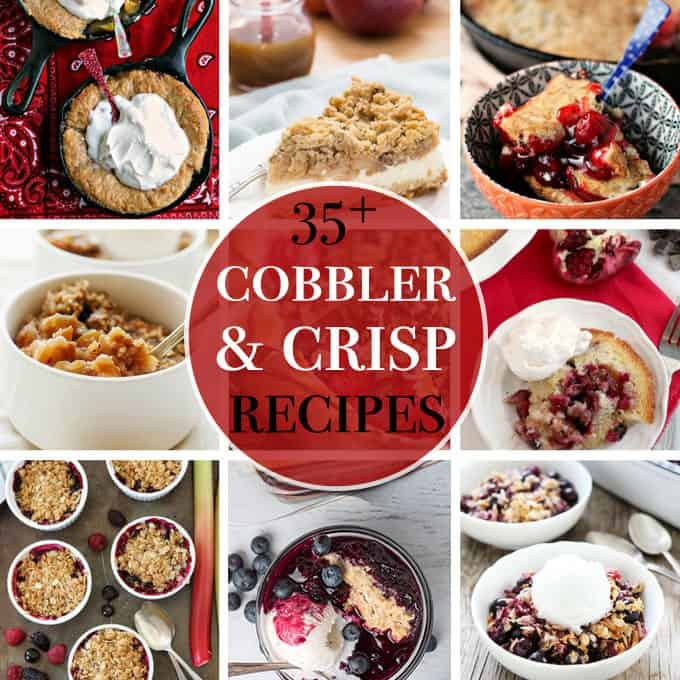 Crisp and Cobbler Recipes: 35+ mouth-watering cobbler and crisp recipes! For the uninitiated, cobblers are kind of like an easier (and arguably more delicious) pie, with a fruit or savory filling and topped with a cake-type batter, biscuit, or dumpling before being baked. For the sweet cobblers, the biscuit or dumpling is often sweetened and also sometimes topped with a sprinkle of extra sugar. It’s a simple, messy dessert perfect for a casual weeknight supper but nostalgic enough that supper guests will still eagerly dig in if you offer them a scoop. Our favorite is this Crockpot Apple Cobbler which uses a cake mix and apple pie filling for a simple dessert! 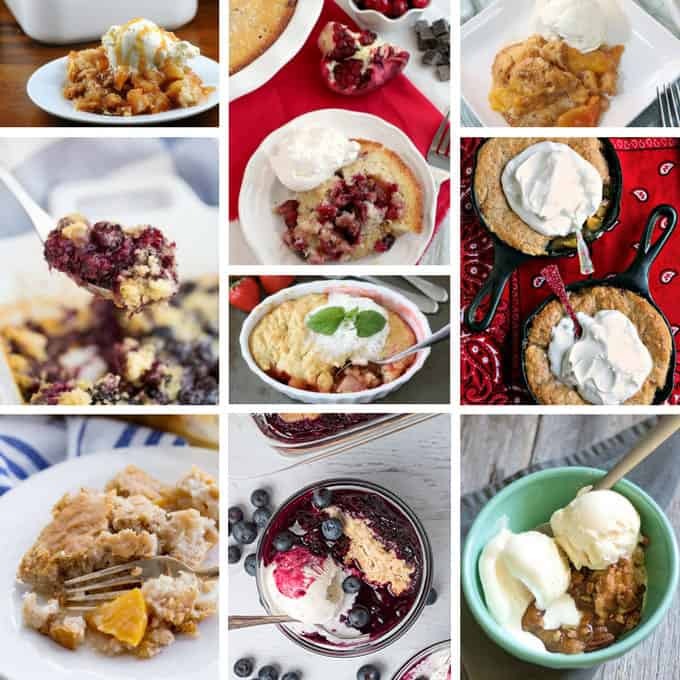 Another easy way to whip up a cobbler in a flash, this Bisquick Peach Cobbler from Easy Peazy Meals relies on the pre-made mix to save on prep time. Here’s an unbelievably decadent Caramel Apple Cookie Cobbler from Sweet Recipeas. Cranberry. Pomegranate. Chocolate. Cobbler. I think I’m going to need at least two helpings of this recipe from Real Housemoms. The perfect amount of spice is the secret to a great cobbler and the Idea Room has that down-pat with her Peach Cobbler. These Grilled Peach Cobblers in Mini Cast Iron Pans from Cravings of a Lunatic are such a cute way to serve individual cobblers. This Easy Pecan Cobbler from The Shabby Creek Cottage is a classic fall cobbler. Our gorgeous blueberry cobbler recipe is absolutely delicious, especially topped with vanilla ice cream! I can’t think of a better way to enjoy fresh blackberries than this Blackberry Cobbler from Spaceships & Laserbeams. A Strawberry Rhubarb Cobbler like this one from Two Peas and Their Pod would be a huge hit at my next family picnic. Our Quick Cranberry Apple Cobbler is the quickest prep cobbler recipe you will ever find. This Blueberry Coconut Crisp from Two Peas and Their Pod is absolutely mouth-watering! Save this Rhubarb Berry Crisp from Two Peas and Their Pod for that brief window when rhubarb is in season for something truly special. When you don’t feel like heating up the house by turning on the oven, this Slow Cooker Apple Crisp from Real Housemoms has you covered. 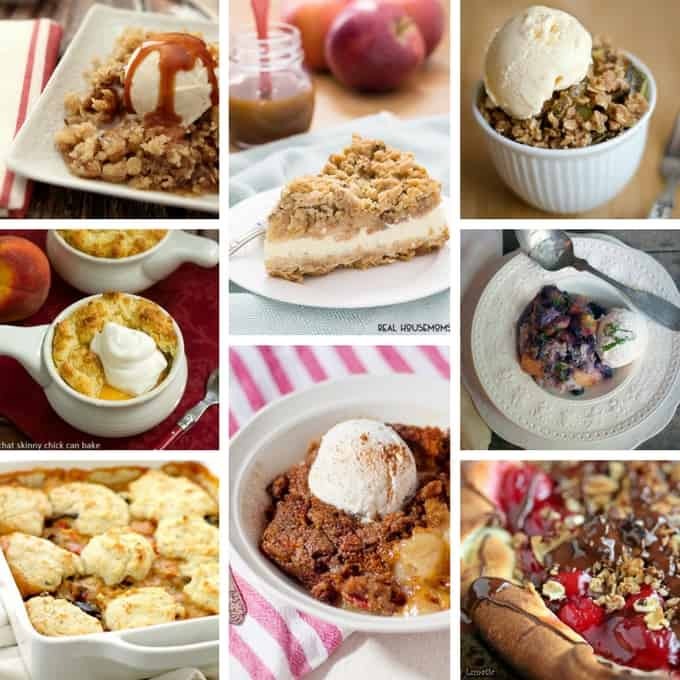 Save yourself the drive to the farm, and whip up this Farmhouse-Style Vanilla Peach Crisp from Simply Kierste instead! Browned butter makes everything out-of-this-world delicious and I bet that’s the case with this Brown Butter Pear Crisp from Two Peas and Their Pod. 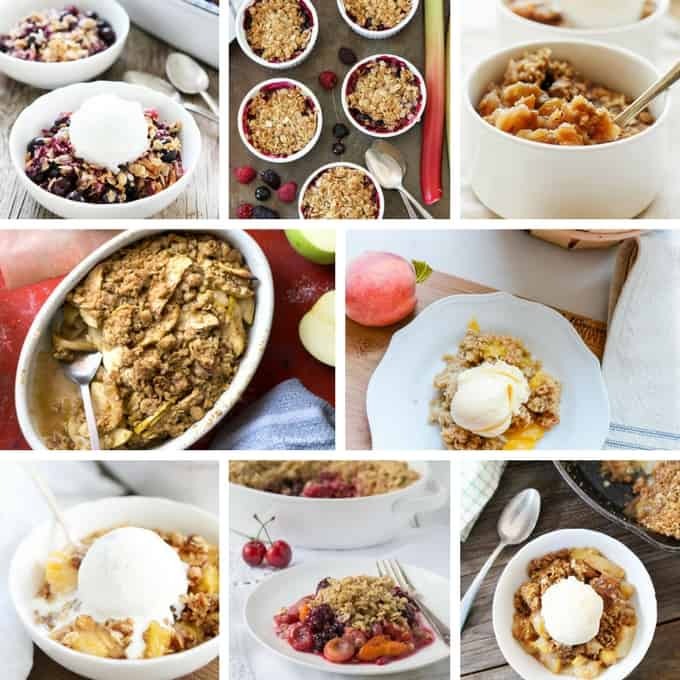 Our Summer Fruit Crisp combines all the best flavors of the season into one scrumptious crisp. Peach Almond Crisp from Two Peas and their Pod sounds like the perfect combination of soft baked fruit and crunchy topping! A classic baked apple crisp is the perfect year-round offering, while our Apple Cranberry Crisp (not pictured) is perfect for fall! And if you’re on the fence about peaches like I was for a long time, try out our Peach Pear Crisp – it will make a peach-lover out of just about anyone! For the grown-ups only, a Boozy Apple Crisp from Creative Culinary. This Apple Crisp Cheesecake from Real Housemoms sounds so decadent and perfect, I want a slice right now! You’ve heard of zucchini bread – why not a zucchini crisp like this delicious recipe from Live Eat Learn? It might sound a bit out there, but trust me – this Peach Blueberry Basil Cobbler from Lana’s Cooking will have you wanting to add basil to all sorts of fruit recipes. For those who crave everything in pizza form, a Chocolate Cherry Cobbler Pizza from Cravings of a Lunatic. This Gingerbread Apple Cobbler from Lana’s Cooking just tastes like a bowl full of Christmas! A Vegetable Cobbler with Cheddar Biscuits from Diethood sounds like the perfect comfort food for a cold day. Old-fashioned Cornmeal Johnny Cakes top this Peach Pear Cobbler from That Skinny Chick Can Bake. 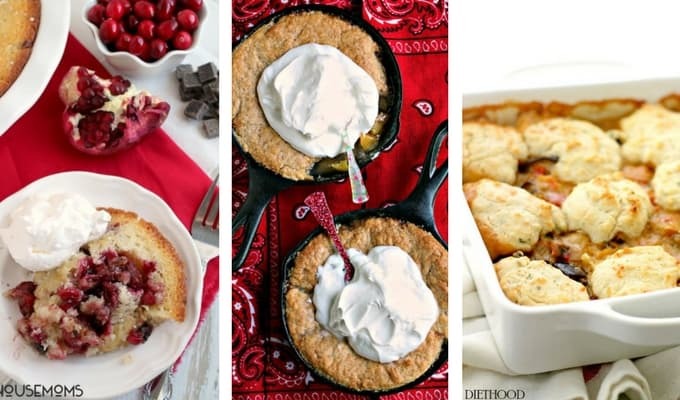 Do you have a favorite crisp or cobbler recipe that we missed? Drop the recipe or link below!